Hello and welcome to the Journey Journal Online travel podcast. This episode I will talk about planning and taking a trip to Munich, Germany for the annual Oktoberfest. I just returned from my third trip, and I had a fun time once again. You can get excited about going any time of year, but I suggest you start looking at flights and hotels about six months in advance. Hopefully you can start planning for next year now or listen to this episode again to help you out. Let me get started by talking about Munich. The city of Munich is in the German state of Bavaria. It is in the southern part of the country at the start of the alps. When many Americans picture Germany with men wearing lederhosen, and little wood houses covered in flowers, its really a picture of Bavaria that they see. This could be because after World War II the allies divided up Germany into sections that they were each responsible for. The United States got control of the south of Germany. Many American GI’s brought back the souvenirs and memories from this part of the country. Munich itself is a large city, but its a beer drinking city. The bustle of big city life seems a bit smoothed over by the many bier gardens and parks. To me it feels very safe and clean. There is a great mix of old architecture, as well as modern structures like the soccer stadium and Olympic park. There are plenty of museums and tourist sights, and an excellent public transportation system to take you around to see them all. My favorite sites, though, were the beer gardens. A book that I recommend is The Beer Drinkers Guide to Munich. This gives a rating, and history to each of the establishments it features. It even tells you how to get to each one and what train lines to take. I’ll have a link on the website where you can order it from Amazon. Speaking of Amazon, I do put a few links to products sold by Amazon on my website at journeyjournalonline.com. If you click on the links from my site and purchase something I get a small percentage. This helps to cover the costs of putting this podcast on the Internet. Each of the products I put on there are things that I use or recommend, but you could buy anything you like after you click on my link and it would still help me out, so if you’ going to buy something from amazon anyway, I would appreciate it very much if you click on my links. It won’t cost you any more but it would help me out just a little. Well, enough of that, lets talk about the Oktoberfest! The Oktoberfest in Munich is an annual festival that was originally the celebration of a royal wedding of Crown Prince Ludwig to princess Theresa in 1810, and the citizens of Munich have been partying in the same spot ever since. Nowadays the grounds of the Oktoberfest contains 12 large tents and many other smaller ones. There is a huge midway of wild rides and vendors to sell all kinds of traditional and not so traditional souvenirs. The tents themselves are huge structures that look more like permanent buildings. They are each decorated a bit differently, but you can expect long communal tables with benches as the seating. All tents will take reservations, but only for a full table, and this must be done very far in advance. If you are traveling alone or with a small group, I would suggest arriving pretty early in the day and finding a seat at one of the sections set aside for those without reservations. These are marked with signs in German, but if you ask, someone should be able to help you out. Pretty much you just find an open bench and ask if its free. After that you have some instant new friends. In almost every case I have seen you must be seated at a table to be served beer, and food in the tents, so don’t be shy, and if at first you get turned down because someone says their friends just stepped away, you can move on to the next spot or try begging a bit. This worked for me when I took my parents to the Fest and a little bit of pleading in my halting German did the trick. You’ll want to order a beer first. If they have a selection you will probably get to choose between lite (helles) or dark (dunkel). The beer only comes in huge one liter mugs called a Masskrug or mass for short. The only exception is at the wine tent where you can order a wheat beer which comes in half liter sizes. The food deserves as much credit here as a main attraction. Roast chicken, duck or schnitzel will fill you up, but they are all delicious too. I have never had chicken that is roasted in quite the same way, and if you are adventurous, and very hungry, try the pork knuckle (schweinhaxe). This is the lower leg joint of a pig, and it really kind of tastes like bacon in the form of a big roast. You and you new friends will get to toast your good fortunes often, because each tent has live music. About every 20 minutes they will play the “Ein Prosit” song and everybody sings along and clinks mugs at the end before downing a big gulp of beer. Don’t worry if you don’t know the words, you soon will. The music during the day can range from traditional brass oom-pah bands to a hybrid rock/oom-pah. Then at night things get a little wilder and you will hear lots of American style covers, a lot of it in English! If you have had your fill of action inside, there is still plenty to do outside while walking around the Wiesn. There are huge carnival rides for kids and thrill seekers. These are much bigger than a typical county fair ride in the US. At night they are fun to watch all lit up and playing loud techno music. There are food vendors and souvenir stalls everywhere you turn. But the whole area looks like its always been there. Before you leave be sure to grab a cappuccino and a pastry or doughnut to keepy ou awake on the train ride home. I’ve been asked before how much it costs to “get into the Oktoberfest”. The one nice thing it it doesn’t cost a thing to just go there. Speaking of the train ride, let’s talk about getting around and staying in Munich. The public transportation system is amazing with a cheap and easy to navigate subway. The trains are called either u-bahn or s-bahn trains. There are also buses and trams above ground. I haven’t had to walk very far to get to a station, and you can buy a day or multi day ticket that allows you to walk on and off almost anywhere. To stay in Munich during Oktoberfest is unfortunately expensive. Hotels and pensions charge their highest rates, and you must book far in advance to be sure you have a room. I have never tried hosteling or couch surfing during this time, but there are so many people that I would imagine at even these options would be hard to come by at the last minute. You can get slightly cheaper rooms away from the city center and still get in by train. Even without the Oktoberfest, Munich is a fun destination city full of beer gardens, parks, museums and fun neighborhoods to explore, and those beer gardens will give you a feel of Oktoberfest any other time of year. Outside of Munich in the Bavarian countryside you can get a feel for rural life in Germany. A short drive or train ride will take you to Oberammergau. This famous town performs a passion play every ten year, that encompasses pretty much the entire village. If you happen to go for the play or are just visiting in one of these years, beware of the crowds and parking situation. Otherwise, it is a neat village with houses that have murals painted across many of the Walls. There are picturesque buildings with wooden balconies full of colorful flowers. It’s what you expect a German alpine village to look like. They also specialize in wood carving, and you can find shops packed full of carvings. Many specialize in religious figures, but there are many that carve human and animal figures from several inches tall, to life size or larger. It’s best to make one of the villages your base of operation while you explore other attractions in the area like Neuschwannstein castle and Hohenschwanngau castle. These are conveniently right next to each other. If you can’t pronounce Neuschwanstein, I guarantee you have seen pictures of it, or another famous castle modeled after this one in Walt Disney world. It was built by King Ludwig II aka Mad King Louie in the mid 1800s. It was made to look like a fanciful interpretation of a medieval castle, and was inspired by the operas of Richard Wagner who was a friend and favorite artist of the King’s. Ludwig built several lavish castles in Bavaria, and had plans for more until his mysterious death. That is a story for another time, but I’ll just say that both of these castles guided tours are worth the price. During the summer I understand that the crowds can be pretty large, and the only way to see them is with a guided tour. Each ticket is timed and you must be in line at the right time to get in, so make sure you plan well and plan ahead. In the off season you can show up to the ticket counter and purchase tickets for the same day, but you may have to wait around and sip a beer until your appointed entry time. They are not publicly owned, but instead are still owned by the remains of the Bavarian royal family. Taking pictures inside is not allowed, so if you want some images of the inside, be sure to stop at the gift shop. Linderhof is another recommended castle of King Ludwig’s. It was one of his fully completed castles, and has a large grounds to explore with statues and little mini temples. It even has a man made underground grotto, where the king would have performances of Wagnerian operas. I guess it’s good to be the king. While you are driving around, be sure to stop in at some of the churches and cloisters open to the public. At Closter Ettal, not only can you wander around an active monastery, but you can get some darned good beer. Remember that monks are some of the best brewers. It is said that when they fast they can still drink beer, so they make a pretty hearty brew to sustain themselves. A stop at the Wieskirche, or church in the meadow is a good place to sit and relax for a few minutes while your jaw drops from all of the rococo decoration inside. Churches like this were likely the only culture and entertainment for people centuries ago, so they were decorated to teach the bible stories and inspire the congregation to follow their teachings, while demonstrating the majesty of the Catholic Church. A more somber day trip from Munich is to the Dachau concentration camp. It is a short drive or train ride away and displays a reminder of the horrible holocaust of World War II. This particular camp housed political dissidents and other people undesirable to the Third Reich, until close to the end of the war when Jews were sent here and the camp was packed over capacity. There is a self guided audio tour documenting the atrocity and history throughout the war until it was liberated by allied troops. The grounds are pretty large, and to listen to the tour at each of the areas will take several hours. Outside is a history center where you can get more information and resources about the camp and the holocaust in general. If you have the time for an extended trip you can keep traveling on the romantic road. This is a scenic route through back roads and villages. For overnight stops I would suggest Rothenburg and Nuremberg. Rothenburg is a well preserved medieval walled city. It is accessible by car or train and there are plenty of small b&bs and inns to stay in that are full of charm. If you are staying overnight in Rothenburg take the night watchman’s tour. There is an English version and it doesn’t cost anything upfront, but they do pass the hat at the end allowing you to pay what you like. The tour is a little on the cheesy side, but kind of fun if you just go with it. You will get a bit of history and a nice walk around the city after dark. 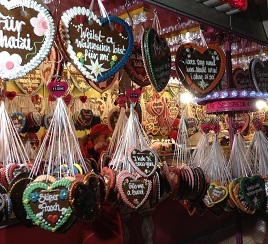 Other attractions in Rothenburg are walking the wall, shopping, and visiting several of the small museums. A trip north to Nuremberg gives you another walled old city within a larger modern city. This was the home of artist Albrecht Durer in the 16th century. In fact there are two museums dedicated to him here. There are also larger museums and lots of interesting streets to wander. They even have their own style of sausage that you will only find here called Nuremberger bratwurst. They are about the size of breakfast sausage links in the US, and served grilled. On my visit several years ago I had a bit of a funny thing happen. I was playing tour guide for my parents and driving around to find one of the museums. After getting a little lost I pulled over to a side street to get a look at a proper paper map. As I was looking at the map I heard my father exclaim, ” oh my!” and my mom said, ” oh Lee you take us to the nicest places!” I looked up and discovered that I had parked in the middle of Nuremberg’s red light district. We were right between a strip bar and a row of brothels with ladies leaning out their windows. We had to laugh, but I got a bit flustered and took off right away. It was nothing dangerous, just not what we’re used to here in the US. If you want to high tail it back to Munich you can use this opportunity to drive on the autobahn. Outside of the developed cities, there is no speed limit on the divided highway. Be careful, though as there are rules to how things are done. Choose your speed, and only use the passing lane to quickly pass slower traffic then get right back over in the right lane. No matter how fast you are going there is sure to be a native German zipping up behind you flashing their headlights to signal you to get out of the way. And by the way there is a posted speed limit when the road is wet, and the drunk driving laws are very strict at .05% blood alcohol limit, so don’t even think about that. There are many places within easy train travel distance of Munich, but if you want to day trip or overnight in Austria, Salzburg is an excellent choice. It’s about 2 hours away by train, and the birthplace of Wolfgang Amadeus Mozart. The famous composer has two museum houses dedicated to him and a larger than life statue in the central square. When you exit the main train station head to the Tourist Information center to purchase a ticket that will get you on all the city buses for the day, or how ever long you are staying. Shopping seems to be one of the main attractions here. There are many winding streets lined with chic shops, and restaurants. The movie “The Sound of Music” took place in Salzburg, so there are tours that cater to big fans of the movie, although from what I’ve heard they mainly cater to Americans. For me there were two main highlights not to miss on a day trip to Salzburg. One is the castle on the hill above the city. You can’t miss it since it can be seen from everywhere. There is a funicular that will take you up to the top for a walk around inside the walls looking down on the city. The museum inside was also interesting and worth the admission charge. The second main attraction is the Dom, or cathedral. Inside it is massive. A walk around to view the statues, artwork and baroque architecture are a must at any cathedral, but this one has an amazing pipe organ. There seem to be pipes all over the place, and if you are there in the right season, you can catch a recital on certain days of the week. If you have more time, Salzburg is great for just wandering and exploring. The narrow streets and colorful buildings just give you that old Europe feel and the bustle seems like it has been this way for centuries. So there you have it. You can use Munich and the Oktoberfest as a launching point to go visit Germany. And don’t just limit yourself to Germany. Other great European cities are very accessible by train or plane. You might find that taking a hop in a commercial jet to someplace like Prague, Amsterdam or Rome is the same price as the train, and then you can fly home from there with an open jaw ticket. It’s a pretty common thing to do in Europe, so don’t let it hold you back from seeing more of the continent. I just got hooked on the Oktoberfest as a fun time, and I hope I can meet up with you there some day. Thank you so much for downloading the podcast. Please give a review or some feedback if you can, and also check out my resource links on journeyjournalonline.com. If you are going to book some travel and want to try hotels.com, they have a really cool program where you can get a free night after you book 10 nights through them. Also, clicking through my site would really help me out to pay those bandwidth bills. I’m glad to be back and I can’t wait to bring you more great destinations, so until next time, enjoy your journey.